Sounds like a ton (more) of work for free content, but maybe they could do a pay-per-view version with all that stuff, to make it worth their while. @yzedf: doesn't look like a Reserve, and it appears to be alloy. Lo and behold, if you read the comments, he identifies it as a WTB rim. 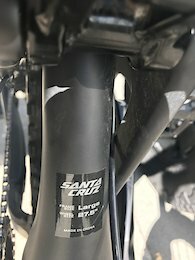 He rides a Santa Cruz bike, that's why they tagged them. 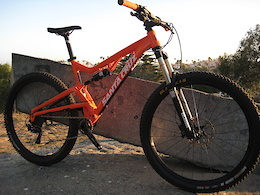 Pretty much a do-anything, no brainer bike, that will make anyone happy. Fast smooth and forgiving. 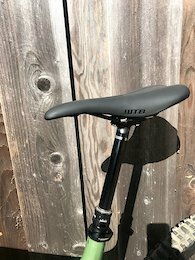 Had an injury, so can't ride quite as much as I'd like I don't know how much it weighs, but it's about as light as you can reasonably get. 2018 Santa Cruz Bronson v2 Frame: CC-Level Carbon Fiber, Bronson 2, VPP Suspension / 150mm Travel Shock: Fox Performance Elite Float DPX2 / 150mm Travel / Tapered Steerer Fork: Fox Performance Elite FIT4 / 150mm Travel Seatpost: RockShox Reverb Hydraulic Dropper Post / 31.6 / 150mm Travel / Shifter-Style Lever / Matchmaker with Brake Seatpost Clamp: Thompson Saddle: WTB Silverado Team Saddle Headset: Cane Creek 40, with NEW bearings Stem: RaceFace Aeffect R / 50mm / 35mm Clamp Bars: Santa Cruz CC Carbon Bars / 800mm wide / 20mm Rise / 35mm Clamp Grips: Santa Cruz Palmdale Lock On Grips / Black Brakes: SRAM Guide RSC (Brand New Pads) Rotors: SRAM 180mm Front and Rear Shifter: SRAM XO1 Eagle 12 Speed Rear Derailleur: SRAM XO1 Eagle 12 Speed Cassette: SRAM XO1 Eagle 12 Speed 10-50 Chain: SRAM XO1 Eagle 12 Speed Crank: SRAM XO1 Eagle Carbon GXP 34t (not DUB) NEW BB: SRAM Team GXP BB (brand new) --Wheels-- Rims: Santa Cruz Reserve Carbon 27.5 / 30mm Wide / 28 Hole / Offset / Tubeless Hubs: DTSWISS DT350 / XD / 15x110 Boost Front / 12x148 Boost Rear / 6-Bolt NEW Tires: Rear: Maxxis Minion DHR II EXO 2.4WT, Front: Maxxis Minion DHF 2.5WT 3C MaxxTerra EXO / Tubeless Ready Valve Stems: e*thirteen - Set up tubeless, ready to rock Comes with brand new bottle and bottle cage installed. 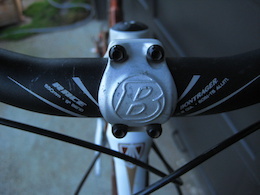 Version 2.0 of the lower link should wrap around the swing arm, rather than sit inside it. This would allow for more substantial bearings, and a larger diameter axle to be engineered into it. Business model is essentially the same as a boutique bike shop, if they could only sell you one frame, and couldn’t provide mechanical support one it required service. Nevertheless a unique design, and progress of some sort. @seaxu: so much reason!!! Ahhhhhhh!!! ??? ?